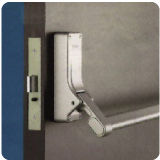 Two point locking, suitable for use on single and double door applications, and for both left and right handed doors, up to 2500mm high and 1300mm wide. Pullman latches, alarmed, or dogging functions are also available. 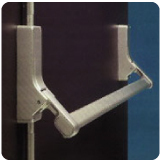 A compact closer supplied with a plastic cover, available in 3 finishes. It is versatile, and models with backcheck (to minimise personal injury risk) or delayed action (for slow moving traffic through the doorway) are available. 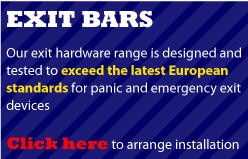 A safer alternative to a double panic bolt. 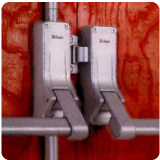 Additional security for doors at risk without compromising safety. Panic operator with mortice nightlatch. Supplied handed, but may be reversed on site if Necessary. It has an anti-thrust device, and the dual profile lockcase accepts both Euro and Oval profile cylinders. It is also available alarmed, or with dogging function.